Broad Peak is located above the Baltoro Glacier in the remote Karakoram Range of northwestern Pakistan. It’s only five miles away from K2 (Mount Godwin Austen). 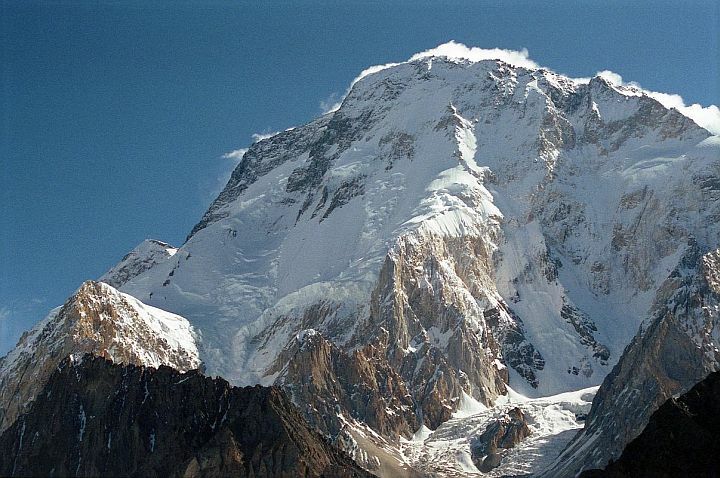 At 26,414 feet (8,051 m.), it dominates the border country between Pakistan and China. T.G. Montgomery named it K3 during an 1856 survey. Later explorer W.M. Conway gave it its current name — for its mile-long summit ridge. The local Balti name for it is Faichan Kangri. The first ascent was by a four-person Austrian expedition. All four reached the summit without the use of supplemental oxygen and high-atitude porters. They were Hermann Buhl, Kurt Diemberger, Marcus Schmuck, and Fritz Wintersteller The date was June 9, 1957. Some have debated if the mountain has two 8,000-meter summits or one; many climbers stop at the lower 26,297foot (8,015 m.) summit rather than reaching the higher 26,414 foot (8,051 m.) peak. American Ed Viesturs, in his quest to climb all of the worlds 8,000-meter peaks reached the upper summit in 2003. On that climb when he made the middle summit he found a party of South Koreans celebrating Han Wang-Yong as the first Korean to climb all 8,000-meter peaks. Viesturs pointed out that their party was a little premature, and that the real summit was that-a-way! So they accompanied him the rest of the way and had a real party!